Here is the list. Although there may be several other features that are useful, it's important to get the basics right first. Safe tank shape - Having a tank that moves the weight closer to the wheels is much safer when you're spraying up steep hills. Especially with a full tank. If the tank is low profile and sits further away from your rear wheels, it could be dangerous spraying on hills. Simple attachment system - All tractor 3 point hitch systems vary in size. Having a system that is universal that fits all brands and is quick to connect is a must. Pressure control - Being able to control your boom pressure from your seat will save you having to get off your tractor. Tank Drainage - You must be able to drain your liquid 100%. A sump in the base of the tank will allow you to remove all liquid to avoid mixing 2 types of chemicals. Agitation - Having an agitation system in the base of your tank will thoroughly mix your chemical. This will eliminate uneven spraying results. This system continually returns liquid to the bottom of the tank causing the water and chemical to swirl and mix. Chemical flush system - This is a new option on modern 3 point hitch sprayers. It is a separate freshwater tank that allows you to flush the chemical from your plumbing lines and booms to remove all the chemical. This means when you use a new chemical, the line are clean and ready. Boom attachments - Having a sprayer that can handle several boom attachments is handy. When looking for a 3 point sprayer, be sure you consider what boom attachments you need. Algae resistant - Having a tank on your sprayer that stops algae growth is more important than we realize. If your sprayer sits in the sun and your tank sidewalls are see-through, algae may begin to grow. Make sure the tank has a solid color to stop algae growth. Not white. Easy to move - When you un-hitch your 3 point sprayer and move it into your shed to store it over winter, you will appreciate integrated fork points that will make this task easy. 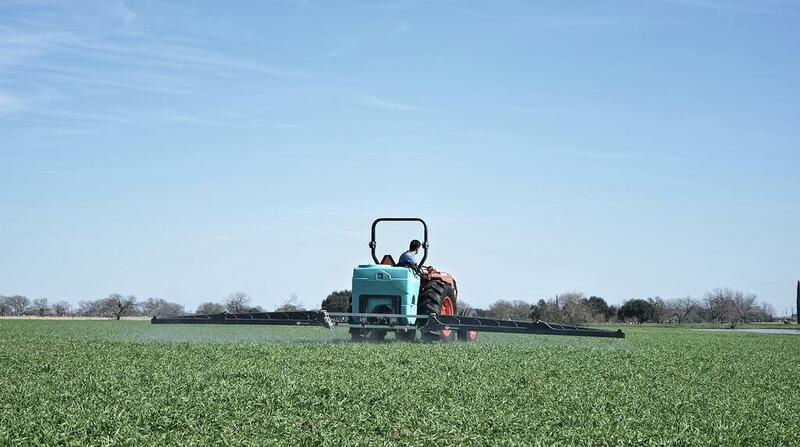 When spraying with a 3 point sprayer, useful boom attachments can make a big difference. To find the right attachments for your application, its important you know where you are going to be spraying. Here is a list of common spraying applications and what sprayer attachment will work best. If the 3 point sprayer you are looking at has the above features, you can be confident you are making the right decision. Choosing a sprayer and attachments that will make your tractor even more useful is easy now you know what to look for. If you have any questions or comments, add them below and we will answer them.